Hello to my dear students and all Bön friends. Tashi Delek to everyone! Here I would like to wish everyone a most joyous, peaceful and happy holiday. Many blessings to you and your families. I had a good short return to sMenri. I spent some time visiting with His Holiness and the monks. I saw the children at BCH. This was a peaceful time of rest and energizing. I also had ability to make a short visit to Katmandu and Triten Norbutse Monastery. I had a great opportunity to visit His Eminence Yongdzin Rinpoche and receive his great blessings. While I was there, His Eminence gave a teaching to Rinpoches, Geshes and senior class monks on The Seven Points of the Enlightened Mind, from the Zhang Zhung Nyengyud. I was happy to be able to receive these teachings and blessings from His Eminence. A few days ago I returned to the United States, back to Yeru Bön Center in Minnesota to celebrate all the many blessings we have received this past year and to prepare for the many blessings for my students and friends of Bon and activities for this next year. So here I would like to announce some things that are very important to Bön, students of Bön, friends of Bön and for Yeru Bön Center. His Holiness the 34th sMenri Trizin, the Spiritual Head of Bön, is travelling abroad in 2019 and coming to the US. This will be the very first time His Holiness travels to not only the United States, but Europe and Mexico as the Spiritual Head of Bön. As part of his trip to the United States, he has chosen to visit Yeru Bön Center and Yeru Retreat Center. We are all honored and understand how important and special this will be. Yeru Retreat Center is in the process of building a temple (Lha Khang) at Yeru Retreat Center, dedicated to His Holiness the late 33rd sMenri Trizin. His Holiness’ visit will be a sort of consecration of the temple. 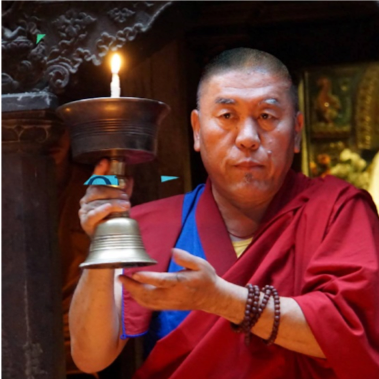 It will not be a formal consecration ritual, due to time limits, but having His Holiness at Yeru Bön Retreat Center for the first teaching and initiations will make Yeru Retreat Center peacefully blessed and transformed. It is with great joy I invite you all to come see His Holiness at Yeru Bön Center and be part of this auspicious event. Although you may have the opportunity to see him at your own local center, His Holiness will give different teachings and initiations at each place. So as much as you can, participate at the different centers and make his historic visit meaningful. This is a rare and significant opportunity in our lifetimes. I encourage you to make time for this important visit. 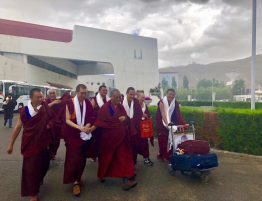 In regard to His Holiness’s visit to Yeru Bön Center, there are several ways to make the connection with His Holiness and the events that will occur during his visit. You can be physically present at Yeru Bön Center during His Holiness’ visit. This way you can make the connection with His Holiness, receive teachings and initiations, and simply be in the presence of His Holiness. Another way is to make this an opportunity to be a part of building the temple at Yeru Retreat Center. You can do this simply by contributing as part of being a Bön practitioner. You can donate a large amount, or a small amount, dedicating this to your loved ones, and obtaining merit or for individual or families. This way you will also accumulate positive merit. This is one of the noble actions of compassion and eternal Bon teaching, by implementing compassion in action. Opportunities like this come only once in a while, not all the time. Every time a prayer is said, or a ceremony is done in the temple, it will continue to benefit you and the ones you dedicate to, as a result of your participation and support. This way it will continue to benefit and clear negative karma of both you and whoever you dedicate your donation to and be a blessing and merit for world peace. My second announcement is about the Khyung Mar statue (Red Garuda). I have given Khyung Mar teachings in the US and other centers for over 15 years. Many people have received these teachings and benefitted from the teachings. 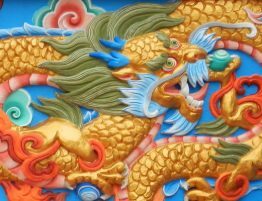 Many have studied Khyung Mar at Yeru Bön Center, through the on-line course, the first retreat at Yeru Retreat Center, the Fire Puja retreat in 2017, and the Drubpa, with me, last fall. Others have studied Red Garuda at other centers. I am pleased that so many students have come so far in their Khyung Mar practice. Therefore, during my recent visit to Katmandu, I commissioned a very special Red Garuda statue. The statue is just over two feet tall. This statue will be placed in the center of the new Retreat Center temple altar. The plan is to have this Khyung Mar statute completed by June, so when His Holiness arrives in July, so he can bless it as well. This will be a great source of energy and blessing of the area to benefit people. 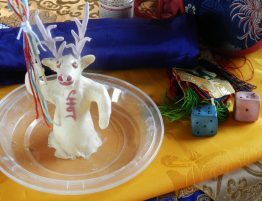 After His Holiness’ visit ends, we will make a traditional and authentic consecration ritual for the Khyung Mar Statue. I’d like to give you the opportunity to be a part of this noble action. You can be part of this by supporting financially, and by being present physically and mentally. You can dedicate your support for yourself, your loved ones, your health, your business, and for removal of obstacles. Connecting and being a part of this noble action is significant. It will purify negativity and uplift positive chi. 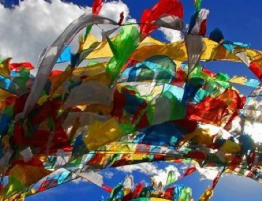 This is how we Tibetans traditionally and spiritually take part in and connect with noble actions. Yeru Bön Center has been very blessed in many ways. The Yeru Retreat Center is currently in the process of building the temple, a new kitchen-dining building and additional sleeping cabins. 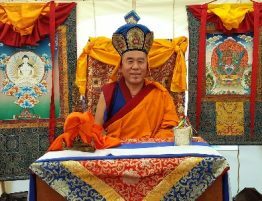 His Holiness’ auspicious visit is in July and August, with teachings and unique and special initiations. The Khyung Mar statue will also be a blessing. These are special things and events that will take place in Yeru Bon Center this coming year. All of this is in dedication to Bön. 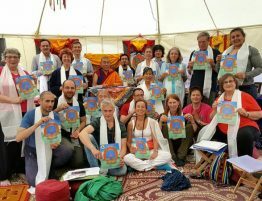 I would like to see you all be part of this, to connect with these events, receive teachings and initiations, and cultivate merit for yourself and for the benefit of all sentient beings. I hope you will be able to support us and take advantage of this opportunity. This kind of opportunity comes only once. This will be the first visit of His Holiness in the US and also in Yeru Bon Center. I request for you to reserve the time to be a part of this noble cause. You can visit Yeru Bön Center at yeruBöncenter.org to get more information about my teaching schedule and other events of Yeru, and to be a part of this very rare opportunity to cultivate generosity and merit for a lifetime. Thank you, and know you are always in my heart and prayers.